What is one thing there is never enough of? COLD STORAGE! 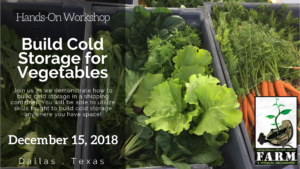 Join us as we demonstrate how to build cold storage in a shipping container. You will be able to utilize skills taught to build cold storage anywhere you have space! Steve Smith, Army veteran, co-founder of F.A.R.M.